It's actually really easy once you've seen it done! I originally used GIMP 2.2.13 under Linux Debian for this tutorial, but this works the same also for later versions of GIMP. I use a Wacom tablet for imput which I cannot recommend enough. But I've done things like this with a mouse too, and it works well, you just have to work a little slower. This tutorial assumes some basic understanding of GIMP, if you are completely new you should probably do the [Beginner GIMP tutorial] first. My setup in GIMP. 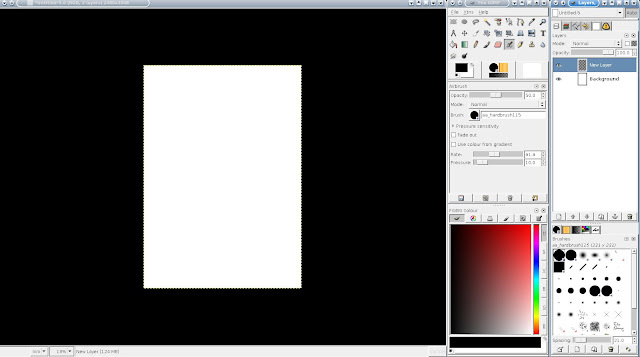 Note how I have airbrush tool selected with an opacity of 50%.l NEVER change this setting throughout this tutorial. The airbrush is a very powerful tool. The advantage of an airbrush set to 50 % is that you can get much more flexibility on what colours end up on the canvas. If you want it more saturated you don't change to a darker colour -- just draw you brush a few more times over the same area. Arguably the effect of this is biggest with a pressure-sensitive drawing tablet, but the idea can be applied in many situations to get a more "relaxed" feel to your work. I have picked a huge hard-edged brush with a size of 231 x 231 pixels. You can easily create such a large brush in GIMP (it's not available initially) by just going into the brush editor and making it as large as you want. 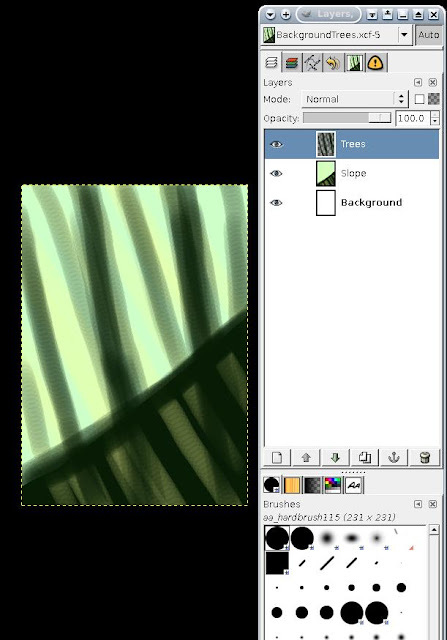 If you have rescalable brushes set up (see my [Setting up GIMP for artistic work / Basic Airbrushing] tutorial), just size it up with a key stroke. Another important thing to note here is how low zoom I have on the image. 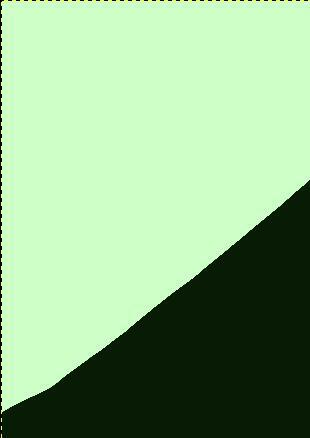 The image is an A4 at 300 DPI (2480 x 3508 pixels), but I'm working on it at only 18% Zoom, exactly like you see in this image. This means I will be able to make strokes that cover the entire canvas (this is where the huge brush comes in too). It speeds up work immensely. Details and zooming can come later, if you really need to. 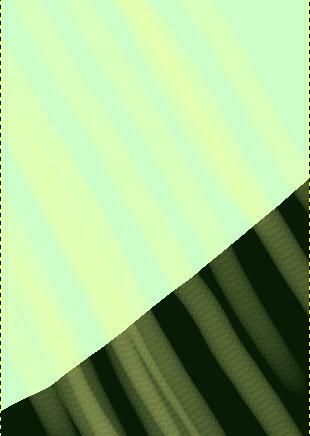 I wanted to make trees in a slope, so I made a slope in a dark green using the lasso and the fill tool . The bright region (you get that by inverting your selection and filling the upper part, again with the fill tool) is the "counter-light". This could come from a low sun or could simply mimic the effect of you standing in darkness looking out at a bright day. The colour can be very bright but you shouldn't make it entirely white since a forest reflects and changes the colour, most often giving it a green tint. You might also want to make certain points brighter later. So stay away from pure white for now. 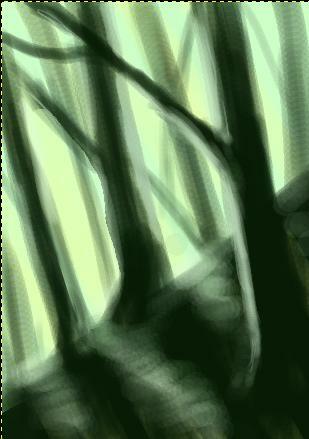 I wanted some structure to the light, so I airbrushed a few thick lines across the image, all still on the same layer. These might look bizarre now, but will help as inspiration later. Time to start making the trees. I create a new layer for this. The huge brush works nicely for making a few large trunks. Make sure you use the transparency of the airbrush by letting outer parts of the trunks be transparent (will look like they are blurred by the lbright light passing them) whereas the "core" of the tree gets more strokes and is completely opaque. Stay with the huge brush and play with colours very close to the background sky-colour to create trees that seem "further away". You can often use colours that are brighter than you would think, just make a few more strokes with the airbrush to flesh out the trunks. Guided by the lighter strokes I did earlier on the ground I established one of the trees as being closer to us than the others. 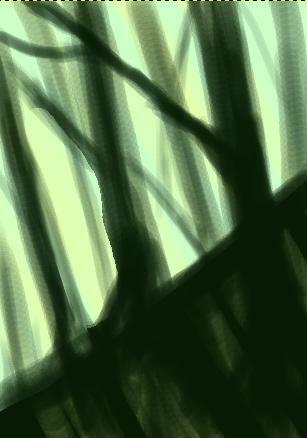 Those lighter strokes makes a natural basis for ground structure and the shadows from the trees come naturally. Now you switch to a smaller brush to sharpen up the "cores" of trees and to make branches that are smaller and sharper. The sharper, the closer, but the airbrush will stop you from making it too sharp. Time for highlights. Put strategic highlights on tree trunks to make them come forward from the background. Establish light lines on the ground, in the same colour as the sky. Make sure to move the brush parallel to the horizon when making lights on the ground. If you just draw lights in straight lines in the direction of the light, it can easily look like a water fall rather than unevenness in the ground catching rays of light. ... but if you want some more details you will need to start zooming. Close in those huge strokes you just did don't look very good. Each stroke is made out of large circles (the further apart they are, the faster GIMP can lay them down, you set this using the "Spacing" slider at the bottom of the brush list). 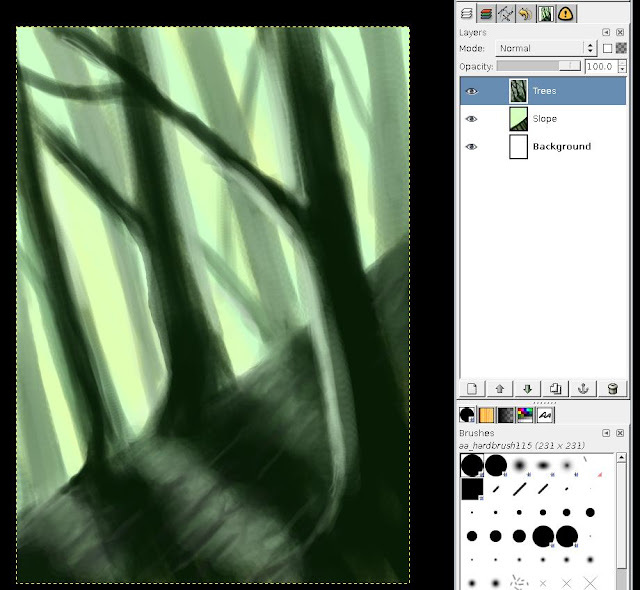 So zoom and start airbrushing with a bright colour to remove the obvious brush artifacts (you need to click the thumb to see these details in the image above, compare trees to the left (unfixed) to trees to the right which I've fixed). This is a finished background. You can flatten the image now (right-click layer list, choose "merge all") and start making your foreground if you want -- put in your wood elf, forest spirit or whatever. If you want to experiment more, having the slope and background light on a separate layer (as we have) helps a lot. Here I tested with a bright light playing along the horizon. All I did was painting white on the underlying layer and brushing with white along the tree edges on the upper layer. One could make the light more extreme if one wanted to, maybe putting fog and having rays of light play among the trees (rays of light are hard to get right though, so beware). The point is that this is very easy and quick to do. Hope someone gets some inspiration to make variations on the theme.